There is probably no room in the house that allows for more 'design identity' without the obvious consequences than a home theater room. If you love Batman, some have made Batman caves with 70 inch screens and luxury leather seating. There is a reason this room has adopted the phrase 'man cave' so easily. It's an environment that should be an expression of the fantasy that enjoying a movie often takes one to. To match the broad spectrum of fantasies, the home theater industry has risen to meet the full range of needs. If you especially like Westerns, there are tons of options for decor and furniture. 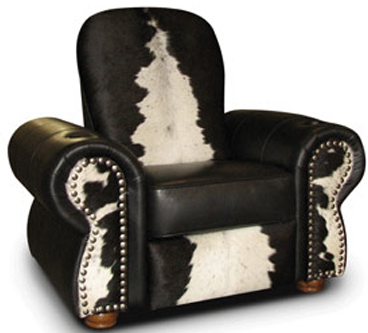 No better in our opinion than Tahoe Seating - the leader of home theater furniture cowhide style. This seat, the Tahoe Ruidosa offers heavily rolled arm rests with thick padding and a custom selection of nail heads to finish the front trim. Wooden feet are offered in a large number of premium woods and the seat can include a power recline mechanism. Select from an almost unlimited hide and leather selection and enjoy a generous 44 inch seat back height.